I'm not college student anymore and not yet worker. So WHO AM I? Hmmm I'm a jobseeker. Who is jobseeker? You didn't know jobseeker? So here it is the definition of jobseeker, check this out. Become a job seeker is big challenge for me because it's hard to get a job. I want to apply job and at first I must be completed the document and one of them is a health statement (body and psychology) from government hospital. Okay I decide to go to the nearest hospital and I tell that I want to do medical check up and she said that I must fill the patient form and pay the administration fee 12k IDR then go to the General Check Up Polyclinic. In General Check Up Polyclinic the employee input my personal identity and tell me that I must go to the cashier and pay "Medical Check Up I" 100k IDR and then they process it and I going to the room check and take some test like measuring weight, high, and tension. And last test about having tatoo or not and ATTENTION for you GIRLS at the test you must take off the clothes except your underwear so make sure that is female doctor who checked us. After do it and my body test is finished, next I go to the psychiatry poly. The employee fill a bill and must pay 80k IDR for psychology test. Psychology test is a psychotest I think you must to do some psychotest like picture test, drawing test, and statement test with intensity scale. 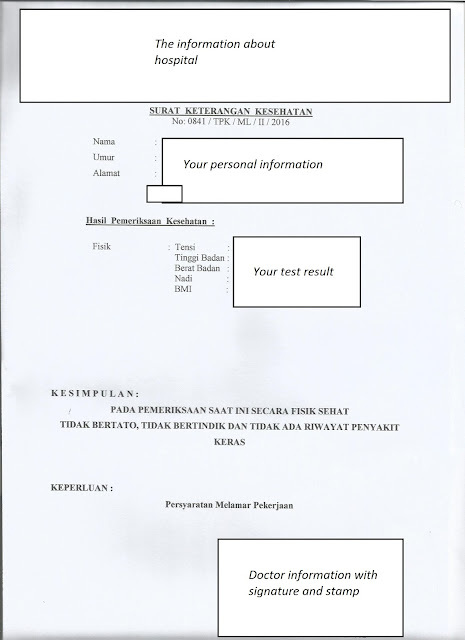 I don't know why this company make this rule for recruitment in first stage (administration) cause its take a long time (test-result) its take a week and for you that have a experience like me you need to prepare at about 500k IDR before you lack of money in the hospital and you must find a ATM and its very waste your time. Oh for your information the psychotest (I call it) held along with others so you must waiting until the participants gathered. After complete the test you need a week before you take the result. But its a bad experience for me cause after complete the document the server down and I CAN'T APPLY after the long stuggle of me but no matter what I still a jobseeker and I should continue my struggle, fighting!! Do you have a some experience about it? I'd love to read it on comments box. 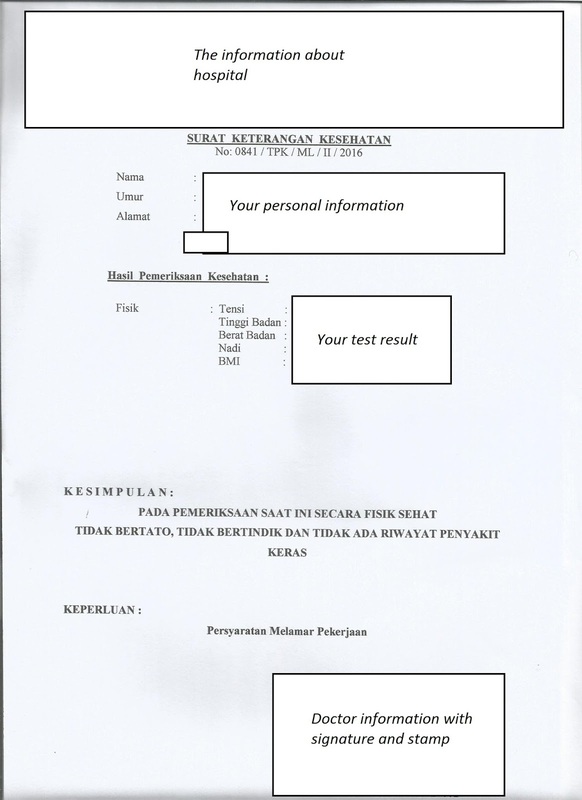 For your information you can check the body check up below cause my psychology check up result is about a week later (wait a week later and maybe I can updating the picture).